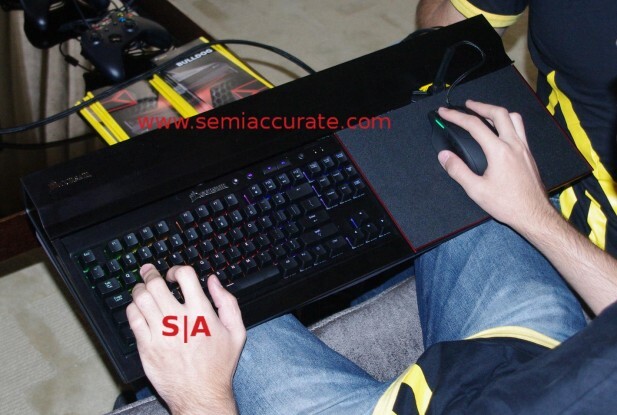 Corsair had four new things at Computex, a case, a keyboard holder, a keyboard, and a PSU line. 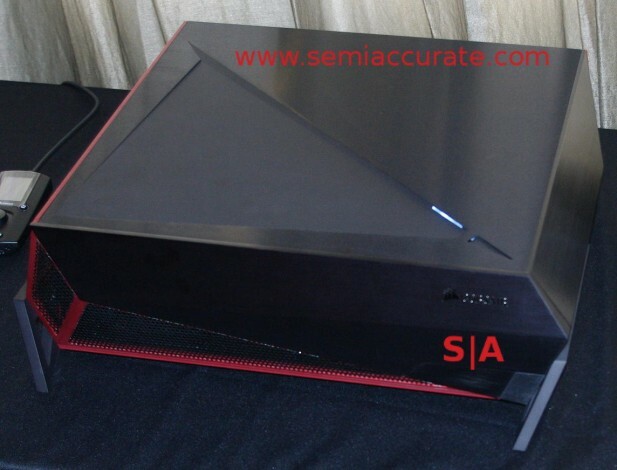 They all displayed the usual out of the box thinking SemiAccurate has come to expect from the company, quite a trick in such mature markets. The first and probably biggest launch is called the Bulldog, and it is something between an HTPC case and a gaming case but incorporates the best of both worlds. As far as dimensions go, Bulldog does not fit neatly into any category, it is a bit flatter than a desktop and looks to be a bit wider than normal too, see? Corsair aims this beast at the 4K gaming market, a niche full of high-end parts and people willing to spend money on them. With that in mind, Bulldog isn’t sold as a case, it is sold as a kit with motherboard, PSU, and an optional CPU cooler. There is also talk of a deluxe or add-on kit with some other bits but that isn’t finalized yet. There is time though, Bulldog won’t be on the market until Q4 and the kit will cost $399, not bad when you consider the board and PSU. That brings us to the interesting point, not the conventional nature of the Bulldog frame but the PSU beside it. The PSU is a 600W from their new RMi line, a mid-range Gold certified set of power supplies. RMi has a zero fan speed mode for low power draw uses, and Corsair put in a fan test button because they were getting a some RMAs from people who… who… they won’t say some people are blithering idiots but we will. The interesting bit about the SF600 PSU that comes with the Bulldog kit is the size. Note how small it is, barely big enough to fit the cooling fan, and quite tiny for a 600W modular part. Like all of the RMi line it uses 100% Japanese caps, both solid and fluid, for added reliability. It is a very slick packaging job. Other RMis will come in 650-1000W ranges, sport Corsair Link, and have fluid dynamic bearings for noise reduction, when the fan is moving that is. Nitwits. That brings us to keyboards or in this case a keyboard holder called the Lapdog. Although it has a keyboard in it, this one does not come with one, it is just a pad for gaming on the couch. Kinda like what Bulldog is meant to accompany in a not so coincidental co-release. The device itself is aluminum and will fit Corsair Keyboards, K65, K70, and Strafe at the moment. They should just slot in and the cables will be nicely contained and tucked away. The mouse pad on the right has a mouse bungee too for cable management and to keep the rodent from sliding into the couch when you move lapdog. There is a wall power cable so you don’t have to run everything over USB for a long distance, and you can power every port at max amperage. Lapdog is an interesting idea and it sure beats an old book or box that you had lying around the living room. If you want one it will be out in Q3 for about $90 or $200 when bundled with the new Strafe keyboard. US specific models will be a bit delayed because focus group testing revealed that the target market really needed a cutout for the ‘average’ user’s gut, and a silicon pad to prevent stomach upset. Just kidding. About the mods. That brings us to the last new item a keyboard called Strafe. It is a cost down variant of the higher end RGB keyboards from Corsair but uses the same LED controller. That means all the dancing light macros that you didn’t program into your higher end keyboard should work with Strafe should you ever get around to writing them.